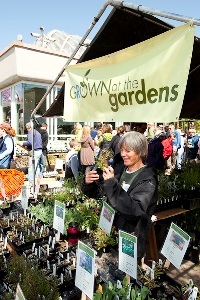 Gardening Season Arrives for Rocky Mountain Gardeners! I can tell gardening season is here, not just by the brilliant sunshine, the gardeners eager to get started, the students jumping into classes that they'll use next week, the plant sale and the shoppers, or the colleague rashly vowing to start his peppers outdoors this weekend in spite of frost warnings at his altitude. Rocky Mountain Gardening has some element of risk and unpredictability after all (last nights low in Denver was close enough to freezing to inspire a protective measures for all the plant sale plants). No, its the sequence of plants blooming, and the patterns of temperatures, and the reactions people make that confirms it all to me. Spring sprang already, and now's the time to get into gardens, landscapes and yards. Its not just the purchasing of plants that's on--it's everything from lawn mowing to sowing vegetable seeds to new projects getting underway. The ideas your neighbors and co-workers are entertaining as varied as they are: ask them! Determined to grow fresh vegetables in an area approximately the size of a business card? Try Super Small Space Vegetable Gardening with Patti O'Neal. As intimidated by choosing a contractor as by working alone? Hiring a Landscape Professional with Curtis Manning is for you. Determined to garden without declaring war on woodland creatures? Friendly Wildlife Management with Joe Julian. The string of subjects is epitomized by the range of Rocky Mountain Gardening classes offered in just the next few weeks: Bluegrass and Alternative Turf Grasses, Friendly Wildlife Management, Pots with Panache, Sustainable Greenhouse Design, Tree ID and Selection, and Trees and Shrubs for Small Spaces. Each of these ideas will bring out your fellow Rocky Mountain residents–and I mean out to their lawn, to a neighbors blooms, to your street-side tree. Once you begin to look, you begin to see all the different arenas in which someone from your community is improving their landscape. Pots, boxes and other containers will show up in many contexts. Some will transform tiny patios into lush landscapes, others will accent walkways and decks, and some will even be plopped directly into planting beds, adding color, height, contrast or even a simple way to move a tender plant out of frost's way. You have your choice of classes (Container Gardens for Shady Spaces, Container Gardens for Hot, Dry Spaces, Pots with Panache) but more importantly, you have choices of personal preference and chances for creative expression. You find that most gardeners take their landscape quite seriously–partly because its viewed as an investment in the value of their home–but they let themselves go a little in a container. Not sure if chartreuse vines go with purple grass? Well, I wouldn't do a yard full, but lets try it in this pot from two years ago. And voila! I believe that really good gardeners are not afraid to experiment... Gardeners who appear to be always successful probably just remove the corpses faster than some us. Speaking of successful and really good gardeners, there's a pair of events to take note of this spring. 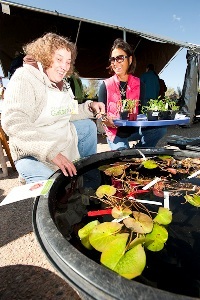 The 2010 Garden Conservancy Open Day in Denver is May 22, the other is its Friday night preview "Inspired by Mountains and Plains: Redefining the Well-Adapted Regional Garden" on May 21, at 7:00 PM. 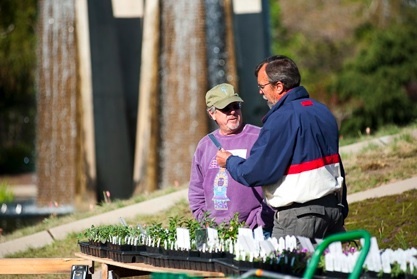 The Garden Conservancy Open Days program features private gardens opened to the public to raise awareness and funds for the nonprofit Garden Conservancy. We are fortunate that Colorado's own garden writers, experts, and personalities have joined together to inspire another year of Open Days in metro Denver, and doubly so to have them many of them speak! I enjoy walking through private gardens because the experience of place is real and tangible, but I love the opportunity to see presentations because it captures another person's view of these spaces. In the case of "Inspired by Mountains and Plains," I expect that the format of the evening, many shorter talks back-to-back, will give me a wealth of experience to have in mind as I tour gardens the next day. Registration for the May 21st event brings you the perspectives of David Salman, owner of Santa Fe’s famed High Country Gardens; Pat Hayward, Director of the Plant Select program; Marcia Tatroe, author of Cutting Edge Gardening in the Intermountain West; Bill Adams, a superb grower of wholesale succulents, alpines and xeric perennials; and Panayoti Kelaidis, Senior Curator and Director of Outreach at Denver Botanic Gardens, whose home garden is also open on Saturday. And then there are the perspectives gained from traveling to more distant landscapes too. 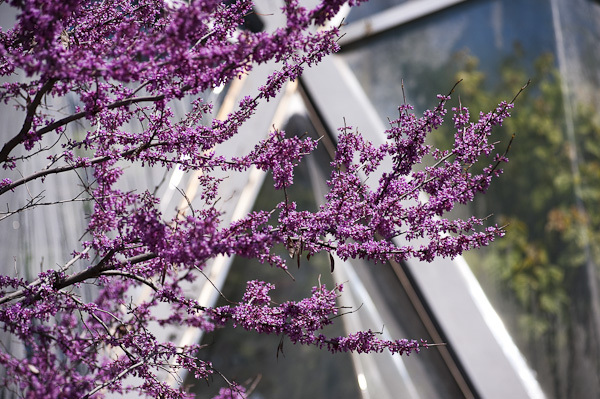 The Colorado Heartland Tour: Magical Gardens at Peak Spring Bloom will inspire you with garden visions selected by Panayoti Kelaidis, places in Colorado Springs and Pueblo that will inform a Denver gardener even as they are different from Denver. Or further afield, the deadline for "Gardens of Portland, Oregon" with Horticulturist Ebi Kondo is just days away: call Pam Rathke at 720-746-0748 right away if you're interested in the June 17-20 itinerary. It can be tough to travel when your garden is calling... but it can be tough to go another year and realize you haven't traveled. Finally, there are many other arts practiced in conjunction with gardening. The culinary arts are always well-represented (Sensational Summer Soups and Salads, Fiesta in Lucinda’s Garden) and photography should be. I was fortunate enough to have access to Scott Dressel-Martin's photographs from earlier today: Scott is responsible for the photographs on the Gardens' main website, among many other beauties. We are fortunate to have him teach for us too: The Next Stop: Take Your Photography to the Next Level is coming up on May 13. One thing I enjoy about public gardens is being involved with the other people who are involved. With all the growers, speakers, instructors, organizers and volunteers that I encounter, there's a palpable sense of pleasure, an unspoken frisson of excitement because something cool will happen next. It can be as simple as invitation to come over and look at my garden, a shared photograph, or it can be a revelation that changes your gardening forever. The season of gardening is here: all you have to do is dive in.